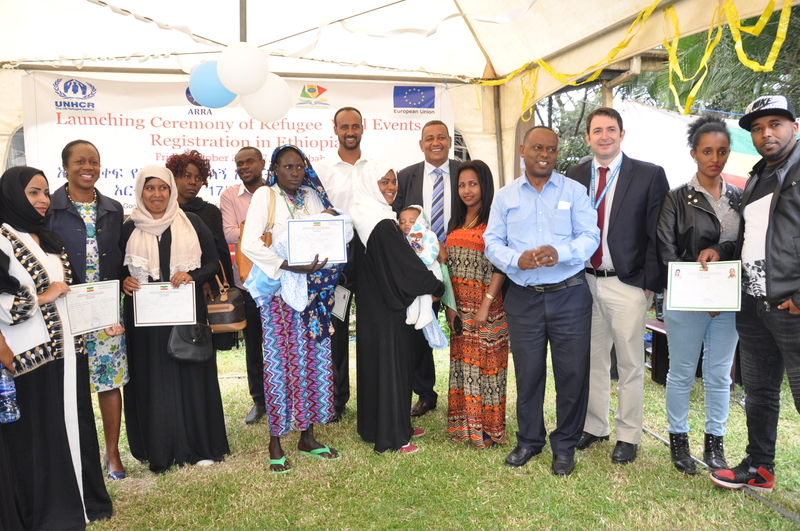 The Government of Ethiopia through its refugee agency, ARRA, today launched civil registration for refugees in the country for the first time allowing refugees receive certificates of their vital events. At a ceremony marking the official launch organized at ARRA headquarters, some 11 urban-based refugees were issued birth, marriage, divorce and death certificates similar to those issued to nationals. 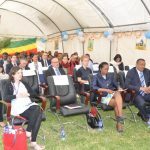 The move is part of the Ethiopian government’s wider pledges and policy commitments to improve the lives of refugees living in Ethiopia as reflected in its nine pledges made at Leaders’ Summit on Refugees held in New York in September 2016. The introduction of refugee vital events registration is part of these wider and more inclusive commitments recognizing the importance of improving the data collection on refugees. Among those receiving the certificate include refugees from Eritrea, Somalia, South Sudan, Democratic Republic of Congo, Yemen who, for the first time, were issued with certificates of registration. The launch is a culmination of wider projects aimed at improving the general registration and data management of refugees implemented In partnership with UNHCR, UNICEF, the European Union and the Ministry of Foreign Affairs of the Netherlands. The latest legal amendment entrusts ARRA, through its parent organization, to administer the registration of refugees on behalf of the country’s Vital Events Registration Agency (VERA). Ato Zeynu Jemal, the Deputy Director of ARRA, congratulated those who just received their registration certificates and assured all refugees in the country that the government will continue to work hard to improve their lives. “We believe that this improved and inclusive civil status information among its other benfits wil serve as a means to obtain information and knowledge about the refugee in the country, generate statistics and ensure more effective delivery of services.”, he said. The Deputy Director underlined the huge resource needs to implement the government’s ambitious plan and called up on partners and the international community at large to do more to help it achieve these goals. Ethiopia pursues an open-door asylum policy and made an additional nine commitments at the Leaders’ Summit on Refugees in New York in September 2016 to further improve the lives of refugees, including the provision of birth certificates to refugee children. The government also vowed to grant work permits to refugees, to strengthen their access to education, to allow a significant number of refugees to reside outside of refugee camps and to locally integrate long-staying refugees. The UNHCR Representative in Ethiopia, Ms. Clementine Nkweta-Salami, joined the head of ARRA in congratulating the refugees and extended her appreciation to the Government of Ethiopia for the historic achievement. 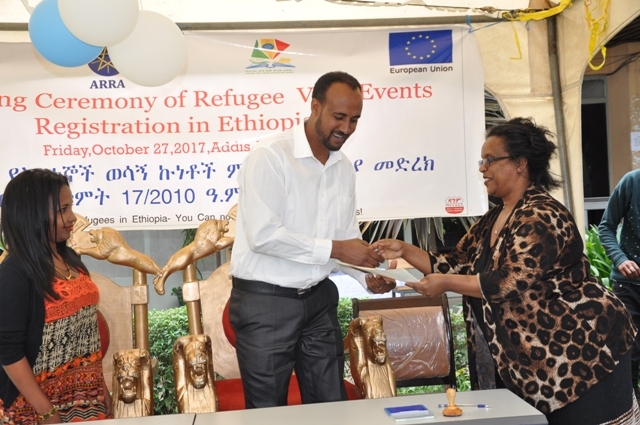 She said, “This is an historic first for Ethiopia and a giant leap for refugee protection in the country. Civil registration will help protect individual rights and provide refugees with better access to legal documentation and basic services”. Ms. Nkweta-Salami assured the head of ARRA her Office’s unreserved support to the implementation of the nine pledges. Birth registration is an important protection tool – ensuring basic human rights, particularly in situations of displacement. It establishes a child’s legal identity and can help prevent statelessness. Civil registration and other records generated from registration data will also allow refugees to be included in policy development and planning in Ethiopia’s Development Agenda – in line with the Comprehensive Refugee Response Framework (CRRF). Representing the refugees, Mr. John Magok Nhail, extended gratitude to the Ethiopian government and all those who supported the roll-out of the Refugee Vital Events Registration system. 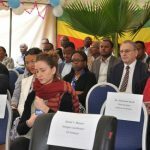 With an emphasis on education, Magok Nhail said, more needs to be done to improve the lives of refugees and called up on the donor community to help Ethiopia realize its plan of improving their lives and making them self-reliant. Ethiopia has a long-standing history and tradition of hosting refugees fleeing war, conflict and persecution and is Africa’s second largest refugee-hosting country with more than 883,000 refugees.